NE to SE and W to SW work best. ATNC1 Acton Camp (MesoWest), Valley floor, 1.5 mi. SE of slope. AA6RV Canyon Country (MesoWest), 9.6 mi, W near freeway. Sharp ridgeline with steep, flyable slopes on both sides, Excellent DS and front-side sloping. Limited parking and tricky landings. Legend has it that this is where Joe Wertz discovered dynamic soaring. Go N on SR-14 23.5 mi. to Crown Valley Rd and turn RIGHT. Go S on Crown Valley Rd, 1.3 mi. to Escondido Canyon Rd. and turn RIGHT. Go W on Escondido Canyon Rd. 0.3 mi. to Hubbard Rd and turn LEFT. Go W on Hubbard Rd. 2 mi. Hughes Canyon Rd. and turn LEFT. Go S on Hughes Canyon Rd. for 0.4 mi. to Parker Mountain Motorway (dirt) and turn LEFT. Go SE on Parker Mountain Motorway for 1.7 mi. to flying site. Go N on SR-14 18.3 mi. to Escondido Canyon Rd and turn RIGHT. Go E on Escondido Canyon Rd. 1.5 mi. to Hubbard Rd. (dirt) and turn RIGHT. Go SE on Hubbard Rd. 2.3 mi. to Hughes Canyon Rd. (dirt) and turn RIGHT. 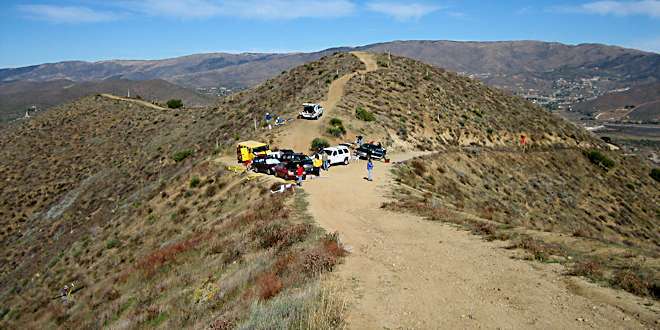 Parker Mountain Motorway is a steep, narrow, unimproved dirt road that is rough in several areas but 2WD vehicles will make it to the top if they have food ground clearance. Also, there is almost no parking area up top so partner-up whenever possible. 34.49105, -118.19830 • Junction of SR-14 & Crown Valley Rd. 34.47179, -118.19736 • Junction of Crown Valley Rd. & Escondido Canyon Rd. 34.47351, -118.20118 • Junction of Escondido Canyon Rd. & Hubbard Rd. 34.47998, -118.23245 • Junction of Hubbard Rd. & Hughes Canyon Rd. 34.47578, -118.23115 • Junction of Hughes Canyon Rd. & Parker Mountain Motorway. 34.49171, -118.28272 • Junction of SR-44 & Escondido Canyon Rd. 34.49788, -118.25860 • Junction of Escondido Canyon Rd. & Hubbard Rd.